The IBC Show floor opens today, but Evertz, Grass Valley, Harmonic, Imagine Comms, and MediaKind opened up the show on Thursday with their annual press conferences in Amsterdam. Here’s a recap of the big announcements from each company. 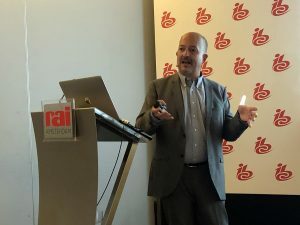 At its IBC 2018 press conference, Evertz (stands 1.D31 and 1.F29) put a major focus on how its ecosystem of SDVN (Software Defined Video Networking) tools can serve the changing needs of broadcasters as IP continues to mature, as well as announced a new entry-level version of its Dreamcatcher replay system. With 400+ IP installations already up and running and the industry’s continued adoption of the ST-2110 and IS-04/05 IP standards, Evertz sees the next year as a turning point for IP and will showcase how new features in its SDVN solutions – such as Magnum orchestration, VistaLINK PRO network management, VUE Intelligent operations and control, and InSite big data analytics – can serve the needs of IP-based facilities. Evertz is also preaching the power of virtualization with its evEDGE virtualization framework for services to run in the cloud. In addition, Evertz unveiled a new entry-level, low-cost version of its Dreamcatcher replay system, dubbed DreamCatcher ONE. The new replay system offers the same key features of other DreamCatcher systems, up to eight channels of 3G/HD, and an easy five-step configuration process. Evertz also announced a the new 3RU DreamCatcher 200NZ Series IP-based low bit rate content recorder (adding ingest, storage and compute capabilities to Dreamcatcher clusters). On the sports-specific side of things, Evertz announced that the Baltimore Ravens’ have installed an Evertz IP router and upgraded its DreamCatcher replay cluster to IP in order to drive its new 4K workflows and larger video displays at M&T Bank Stadium. As broadcasters bandwidth requirements increase beyond what 10GbE pies, Evertz is also high on 25GbE and 100GbE, rolling out a full range of 25GbE solutions, including a new EXE 2.0 25/100GbE switch, a 25/100GbE gateway to interface with legacy baseband systems, a 25/100GbE modular switch fabric, and a 25/100GbE IP multiviewer. Also on hand at the jam-packed Evertz booth in Amsterdam will be several other new products including the low-cost ATOM HD digital recorder (which records right onto USB thumb drives), SCORPION dark fiber and managed IP transport solutions, and the XRF4 high-density RF router that was previewed at NAB in April. It’s been seven months since Belden completed its acquisition of SAM (Snell Advanced Media) and merged its portfolio under the Grass Valley (stand 9.A01) brand. 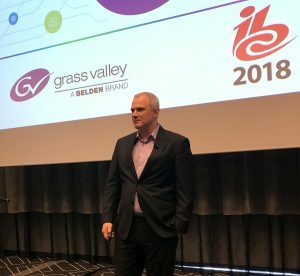 And Grass Valley CEO Tim Shoulders took the stage at the company’s IBC press conference Thursday to declare the integration between the Grass Valley and SAM product lines to be complete – with the fruits of this integration on display at the show in the form of new features for GV Stratus, GV Convergent, GV Flex, ICE automated channel playout, and other products. One of the most notable announcements to come out of Grass Valley’s presser was the public launch of a new R&D initiative dubbed “Core Technology”. Led by VP of Core Technology Mike Cronk and conceived internally back in 2016, the initiative will take a more collective, agile approach to R&D across and embrace what Cronk called a ‘lean engineering’ philosophy that will allow Grass Valley to take product development time “from weeks to minutes.” The Core Technology initiative will deliver common cores, platforms, engines and interfaces across Grass Valley’s entire portfolio, including video processing, IP connectivity, cloud technologies, and software-defined solutions. According to Cronk – who called Core Technology “one the most exciting and impactful things that I’ve ever been a part of” – the initiative will set the direction for the Grass Valley portfolio moving forward and take a modern ‘build once, integrate to many’ approach. Grass Valley will also dedicate a portion of its IBC Stand to eSports this year, partnering with FACEIT to produce a demo featuring professional gamers in a full-scale eSports competition environment. The demo will highlight Grass Valley’s efforts in the esports sector, which include a major technology role at the new Esports Stadium Arlington. Grass Valley has also introduced the new LDX 86N RF head – a wireless, shoulder-mounted 4K RF head that provides a single solution for transmitting HD, 4K and High-Speed HD over the same link – even simultaneously transmitting high-speed phases (up to 3x1080p) with a separate 3G video channel. The new LDX 86N RF camera head is powered by Wave Central’s Axis 4K/HDR/HFR transmitter. Also of note, Grass Valley will have Arena latest IP UHD OB unit – Arena OBZ – on display featuring a host of Grass Valley technology. Harmonic (stand 1.B20) is all about the Cloud and SaaS here in Amsterdam, putting its VOS360 Video SaaS platform front and center at IBC 2018. Among the major VOS 360 Video SaaS announcements at its IBC press conference on Thursday were the launch of a new NASA UHD HDR channel on Roku using VOS 360, new dynamic ad insertion (DAI) and disaster recovery as a service (DRaaS) capabilities for the platform, and a partnership with Verimatrix’s new Viewthority content distribution platform to simplify the delivery of live and VOD content. On the sports-specific side, Harmonic revealed that VOS 360 Video SaaS powered Indonesian mobile network operator Telkomsel’s MAXstream OTT service during the 2018 FIFA World Cup in Russia. Telkomsel’s concurrent viewership grew from 24,000 concurrent viewers to a peak of 550,000 during the tournament, highlighting VOS 360’s high scalability. 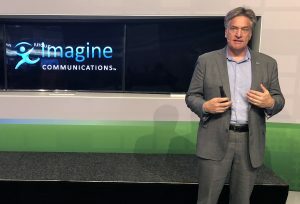 Earlier this year at the NAB Show, Imagine Communications (stand 4.A01) CEO Tom Cotney, who came aboard in December 2017, announced that he was splitting the company into two organizations: one focused on playout and networking and the other on advertising technology. 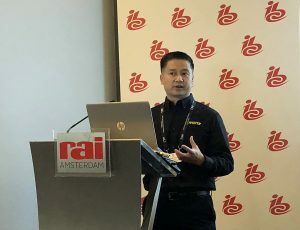 Cotney’s vision, which is heavily reliant on the broadcast industry’s migration to IP-based systems, continued to take shape at Imagine’s IBC press conference on Thursday. With 100 channels launched using IP technology over the past 90 days and a projected 58% CAGR in its IP playout business, Cotney proclaimed that ‘our big bet on IP is finally paying off”. In terms of playout, Imagine is demoing its cloud-native microservices-based Versio Platform, Versio IOX storage solution designed, and Nexio+ AMP highest-density media server with hybrid SDI/IP and H.265 capability. Imagine will also demonstrate various transition scenarios for migrating from traditional to next-generation playout operations at a pace that works for each individual customer. In addition to playout, Imagine is showcasing its latest innovations for live production, including high-capacity 100GbE network links, an intuitive live sports control panel that provides enhanced automation break manipulation, and SMPTE ST 2110-capable processing for HD, UHD and IP. On the ad tech side, Imagine is debuting xG Scorecard, a business intelligence solution that provides at-a-glance, real-time insights and precise knowledge of how spots drive sales for advertisers. 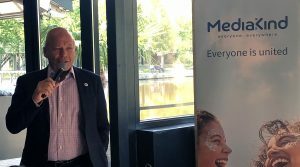 IBC 2018 is serving as a coming out party for MediaKind (stand 1.D61), which officially rebranded from Ericsson Media Solutions in July. The newly renamed company is using IBC as the launch pad for the new MediaKind Universe, consisting of five solutions each named after constellations: Cygnus (Contribution and Distribution), Aquila (Direct to Consumer), Pictor (Video Delivery Networks), Orion (consumer experience), and Vega (services and support).